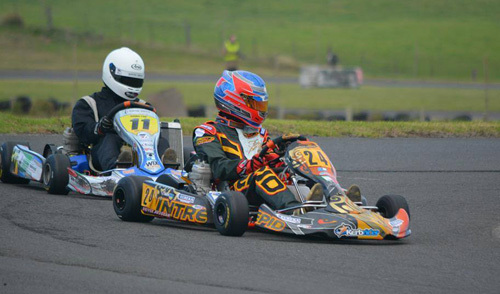 Round 3 of the Victorian Country Series took place last weekend (May 10) at a very wet and cold Warnambool Kart Club. Sunday’s racing was in difficult conditions with sprinkles of rain coming down throughout the day, making for exciting racing. Cadet 9 was a battle royal with Beau Russell taking a firm grip on championship hopes taking pole position after championship leaders Matthew Domanchenz and Will Harper moved to Cadet 12. Russell shared the heat wins with Cowie. The final race for the class became a battle royal between Cowie, Russell, Brodie Thomson and Anton Hortis. Russell slided back through the field with Cowie getting challenged by Thomson with the lead swapping on a few occasions. After a chaotic finish Cowie held on over Thomson in second and Hortis in third. James Wharton was able to take his first pole position of the Victorian Country Series with Cadet 9 graduate Matthew Domanchenz rounding out the front row. From then on Domanchenz was a dominant force taking all three race wins. Wharton battled hard for the final two podium spots with the likes of Blake Purdie, Bronson Boult and last round winner Tex Starr-Mckoy. Purdie was able to take the second spot over Boult in position three. Junior National Light was turned on its head in Warrnambool for round three. Nikki Watson was able to take pole position before Michael Clemente and Courtney Prince won the heat wins. Jaxson Cox got into the lead from a grid 2 start in the Final and managed to hold the lead until the last lap when Clemente (off grid 6 due to a DNF) got through for victory. Cox held on for second ahead of Prince and Nicholas Schembri. Michael Clemente was again on fire again in Junior National Heavy knocking Cody Donald off pole position for the first time in the country series for 2015. Donald and Clemente shared the heat wins and with Donald having his first DNF of the championship, it was shaping up for a fascinating final race. Clemente lead the early stages but Donald was again too strong and was able to take another round win. Clemente was able to come home in position number 2 with Nicholas Carroll rounding out the podium in third. Dylan Hollis took his first start in the Victorian Country Series and he wasn’t beaten in any race. Ben Delaney and Cody Donald were able to lock out the front row with Hollis third after a wet/dry qualifying session. Hollis took pole for the final after both heat wins and got the jump of the start before championship leader Cody Donald took the lead and took the fight to Hollis. Hollis though was able to retake the lead and take the win over championship leader Donald. Championship contender Max Vidau rounded out the podium. Clubman Heavy was once again a two horse race between Remo Luciani and Chris Thomas. 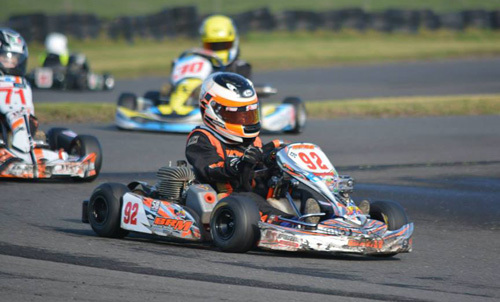 Thomas in his new Deadly kart chassis was able to take pole position. Luciani though took the fight back to Thomas taking out both heat races and taking pole position for the final. Thomas set up a screamer of a dice when he took the lead off Luciani in the final. After a few lead changes Luciani was able to take the win over a very close Thomas. Blake Graham rounded out the top three. After Ashley Lear had dominated the previous rounds of the Victorian Country Series, Will Carroll took a big challenge taking pole position and both heat wins with Bradley Marsh and Lear challenging behind. Off the start Carroll lead but both Marsh and Lear move ahead setting up a great battle. Both had chances of leading and winning the race but the cool, calm and collected Lear took his third consective round win over Marsh and Maverick Benson, who managed to take the final podium spot in his Tony Kart in third. Scott King has dominated every session and every race so far this season and everyone thought no different when he took his third straight pole position of the series. Enter Brad Anderson. King got the jump in both races but Anderson traded fastest laps with current state champion and shaped up to be a fantastic and battle royal in the twelve lap final. Just when everyone thought someone could take the challenge to the four driver King was able to take a convincing win over Anderson. Daniel Rethus was able to round out the podium in third. Brayden Flood has been another dominant force in the Victorian Country Series but when he only qualified in third position spectators thought someone might be able to finally take the fight to Flood. 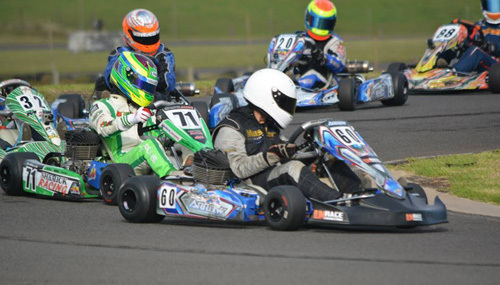 Brayden again was too strong taking both wins in the heats and after a great start took his third convincing round win! Flood led home a great battle between Brock Rae and Tim Rankin. After a few positional changes Rae was able to come out in second spot ahead of Rankin in third. Nicholas Wortley was the form driver in Restricted Heavy after taking the round win last time out in Horsham. After a very intense qualifying session Wortley was able to take pole position. Wortley again was another to show a clean set of heels winning both heat races and the final of TaG Restricted Heavy putting himself a firm contender for the championship. John Dankowski and Barry Clough shared the second and third spots in the heat races and they resumed their battle in the final with Dankowski taking the second spot over Clough. 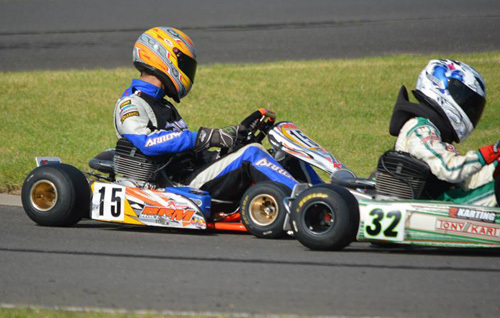 Round 3 at the Warnambool Kart Club seemed the weekend for drivers taking the clean sweep as Andrew Hayes joined that list and arguably took the most convincing win. Hayes took pole position and was able to take both heat wins even after a challenge from Australasian Champion Peter Sloan. The Victorian Champion took an impresssive six second win in the final. The podium spots were left to battle between last time out round winner Martin Golledge and Peter Sloan. Golledge come out on top taking second over Sloan. 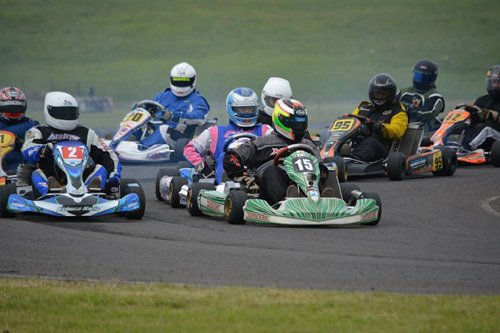 The next round of the Austrans Victorian Country Series will take place at the Ballarat Kart Club on July 19th.